Gazette Notification: ECHS for the purposes of Section 80D of IT Act, 1961 for the A.Y. 2019-20 & subsequent assessment years. Gazette Notification: ECHS for the purposes of Section 80D of IT Act, 1961 for the A.Y. 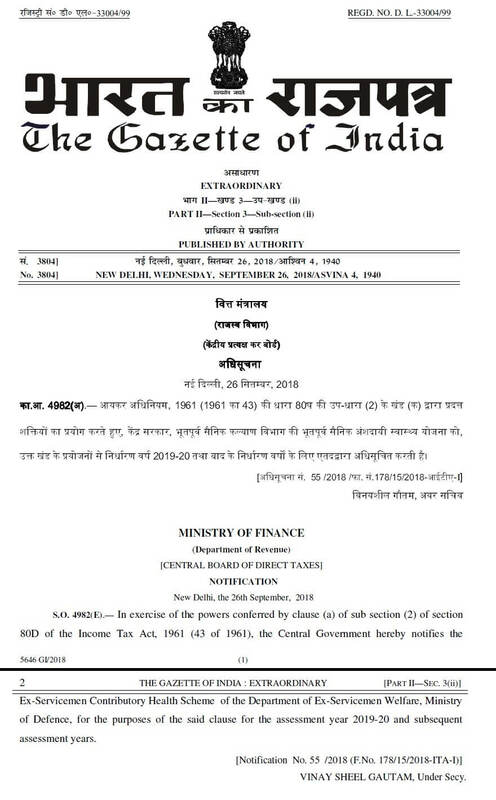 2019-20 & subsequent assessment years..
Central Government Employee News and Tools: Gazette Notification: ECHS for the purposes of Section 80D of IT Act, 1961 for the A.Y. 2019-20 & subsequent assessment years. Central Government hereby notifies the Ex-Servicemen Contributory Health Scheme of the Department of Ex-Servicemen Welfare, Ministry of Defence, for the purposes of the said clause for the assessment year 2019-20 and subsequent assessment years.